The Chapel of St. Hubert is a neogothic chapel in the Lednice-Valtice Area. 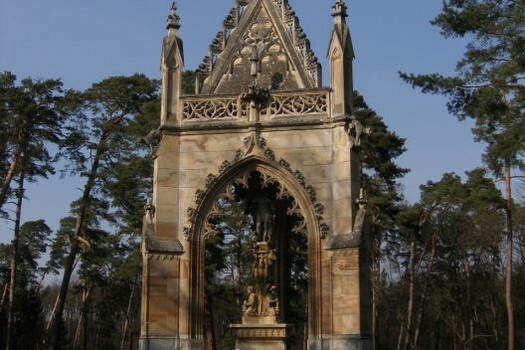 A triangular shaped chapel with three Gothic arches and ribbed vault which was built in the middle of the Boří les forest according to plans by Jiří Wingelmüller under the rule of Alois II Prince of Liechtenstein in 1855. In the middle of the chapel, there is a statue of St. Hubert standing on a pedestal with statues of angels. This newest building of the Lednice-Valtice Area was built from sandstone blocks carved with markings similar to those done by medieval stonemason´s that should evoke the feeling of antiquity. The chapel is protected as a cultural monument of the Czech Republic. 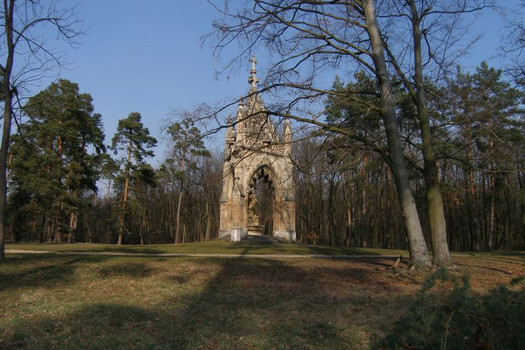 The chapel is located in the Boří les forest between Valtice, Lednice and Břeclav. The yellow-marked tourist route from Břeclav to Hlohovec and the red-marked tourist route from Valtice to Lednice pass the chapel.